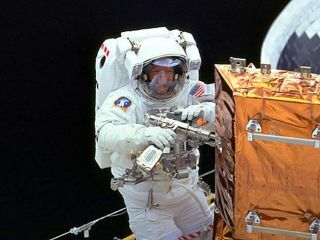 Astronaut using tools during a space walk. Nothing is easy in space. Imagine trying to use a caulking gun while wearing hockey gloves and bobbing in zero gravity. Now factor in extreme temperatures ranging from 150 degrees below zero to 150 degrees Fahrenheit. That's just what astronauts have to do when they need to make repairs to the International Space Station, the Hubble Space Telescope, or possibly, the wings of a space shuttle. Fortunately, there is a whole team of engineers at the Goddard Space Flight Center who build tools and gadgets that astronauts can use as simply in space as they could in their garage. That's where Johnson Space Center officials turned when they decided they needed some new tools developed for their astronauts for use during the Return to Flight mission. For Return to Flight, EVA tool engineers at Goddard, Langley Research Center and JSC worked together to develop tools to be used in case any of the reinforced carbon-carbon tiles on the leading edges of the shuttle are damaged. Short on time, the engineers turned to commercially available tools that could be modified for space. One is a handheld infrared camera used for scanning the tiles for cracks. The other is a handheld temperature sensor--both the wing and the repair material need to be at the proper temperature to make a solid repair. "Whenever we can start with something like that, it makes our job easier," Russell L. Werneth, Goddard EVA manager for the Hubble Space Telescope and Shuttle Return to Flight told Space.com. Not only does cherry picking from a store make the task easier, it helps shorten the development stage of the tool and allows for more testing. "You don't have time to reinvent the wheel," says William Majette of Swales Aerospace that helped develop the Return to Flight tools. "The time is better spent proving that the tool works." While these tools are commercially available, you're not going to find them in your neighborhood hardware store, says Werneth. "We got ours at an industrial hardware outlet." In addition to these two tools, Werneth helped developed three "crew aides" for this mission. Crew aides are devices that will help astronauts use previously developed tools. To make a tile repair, the astronauts would have to bring a whole selection of tools--trowels, scrapers, infrared camera, thermal sensor, and caulking gun to name a few - to do the job. "They have to get all these out to the worksite safely, so we made them a 'tool bag'," Werneth says. "Actually, it's more like a box. It folds up and can be stored in the shuttle's mid-deck locker and astronauts can fill it up with tools for whatever task. So it looks like a simple box or bag to carry tools, but it has the extra thermal and load protection." The other two are for when the tools are taken out of the bag. One is similar to an artist's palate and holds the patching material for repairing cracks to the tiles. "It's a handheld paddle--about the size of a ping-pong paddle," Werneth says. "It's a very simple device, but from the engineering viewpoint it had to stay at the right temperature so it doesn't add or subtract heat to the material." The paddle has heat sensitive tape on it so the astronaut knows that the material is at the proper temperature for making a good fix. The final crew aide, called the modified mini-workstation tool stowage caddy (MMWS), is perhaps the most important. None of the other tools are any good if they float away from the user, but the MMWS makes sure that can't happen. It's essentially a tool belt designed for easy space use--it wraps around the astronaut and has retractable tethers with clips that attach to the tools. While using a commercially available product makes designing the tool easier, tools made for use on Earth don't always stand up to the rigors of space. In the case of the thermal sensor, the engineers found that the probing mechanism didn't work properly in a vacuum, so it had to be modified to read the correct temperature. Extremely high and low temperatures are also tests that each tool must pass. "Most commercial units go into the hot range, but not as cold as we'd like," Majette says. Most of the wires and other electronics need to be swapped out to handle the extreme temperatures and vacuum conditions. "We change the circuitry. In a lot of cases a tool will have more functions or displays than what we need," Werneth says. "We want to remove the extra to reduce the risk of failure." Also, the casing needs to be strong enough so that it doesn't sustain damage during lift off or landing. Finally, each tool must pass the hardest test of all before being placed on the shuttle--getting the "ok" from the astronauts themselves. The tools need to be easily maneuverable when wearing bulky gloves, says Majette, and they need to be able to flip all the switches and press all the buttons. "We make a plastic model and present it to the crew," Werneth says. "The crew have actually been to space and done space walks, so they always have personal preferences or reasons for us to come up with better designs. We can test them at 1G or underwater, but we always get the crew's opinion--they're the real users." Most of these tools were developed to correct the failures associated with the explosion of the space shuttle Columbia. While most engineers get excited to see their tools in use, the designers of this particular batch feel quite differently. "As part of the NASA team for Return to Flight, we're all proud that we have had a part in the mission," Werneth says. "But, at the same time, we've delivered tools to the astronauts that we hope they never have to use."